The Opus 66 is a compact supercardioid dynamic mic designed for percussion miking. 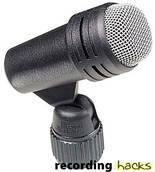 Its small, end-address body has an integrated mic clip. It is part of Beyerdynamic’s “Opus” series of instrument microphones. The mic ships with a storage bag (and the integrated MKV 87 mic clip).